Olive Ayhens, Rapid Commute, 1996-1997, oil on canvas, 63 by 52 inches. Olive Ayhens's nine expressionist oil paintings of New York City's skyscrapers are filtered through a wild and free imagination that takes license to bring the natural world into the concrete-and-steel jungle or, conversely, to interject the buildings into rural scenes. Originally from San Francisco, Ayhens moved to New York in 1996. She has been exhibiting since 1972, but these works made between 1996 and 2000 comprised her first solo show here. Ayhens often personifies the buildings, emphasizing their individuality through a surprising variety of marks, patterns, and color combinations. She made several of the works during a World Trade Center residency in 1999. Manhattan Rooftops (1999-2000), 48 by 40 inches, captures the density of the city facing east from the tower where she had her studio. We see no streets, only rooftops and the descending structures packed close together, playfully skewed and warped. A wide yellow building in the bottom right is precisely and thinly painted with a pattern of black and blue windows that creates a textile-like plaid. in contrast, impastoed black lines form the windows of a nearby green wedge-shaped structure. however, her primary subject in this piece is the potential oasis that exists at the top of each building; the roofs are often elaborately designed and bedecked with chairs and tables, large gardens, crowds of full-grown trees, water towers and plastic swimming pools. At times, Ayhens allows fantasy to take over -- the entire top of one structure in the lower left is a pool in which a little figure swims. In Skyscrapers in Yellowstone (1998), Ayhens encircles an open plain where two bison graze with familiar New York buildings. The urban elements are surrounded by fir trees, a waterfall and distant mountains. 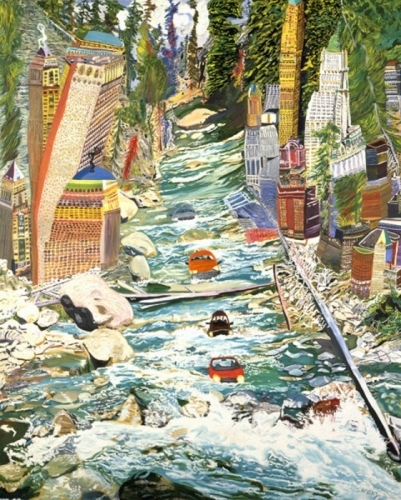 The similarly fanciful Rapid Commute (1996-1997) depicts an alpine setting with trees and wide stream; the frothy water ushers down four cars. On both sides of the stream, skyscrapers and an urban waterfront replace cliffs. These engaging evocations of impossible circumstances ring true because of the obvious pleasure Ayhens takes in paint. In The Streams Return (1997), another riff on the theme of alternative auto transport, a line of cars floats through New York Harbor into Lower Manhattan, where water flows through the streets between the buildings. Ayhens presents a humorous and thought-provoking image, not a tragic one. It suggests the collapse of eons into one moment: in the distant past, water did flow through the island, and, as has been predicted. glaciers may well return to the area. Of course, by then the appearance of the island will have changed far beyond her contemporary portrayal. These images cohere with a tense wholeness, held together not by rules of perspective but by Ayhens's painterly will.